It was Friday night December 9th, 2005. We have been awaiting this day because The Orchestra had arrived in Guatemala City. Guatemala City is the capital of Guatemala, Central America. 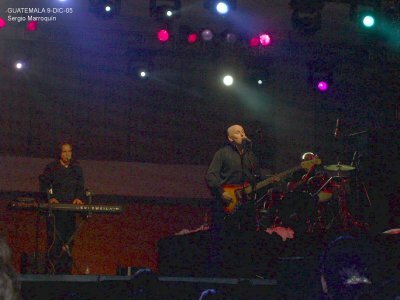 It was the first time the band have performed in our town and a local radio station, “FM Fama” sponsored the event and made a big promotion including various jingles advertising the concert and playing ELO music. 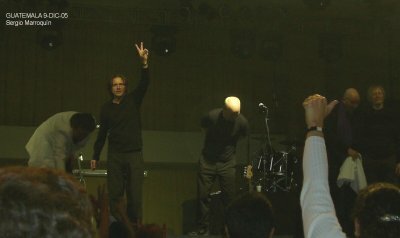 The concert was at the Grand Tikal Futura Hotel, the biggest hotel on the south side of the city. There are two building towers, one is the commercial and shopping mall and the other one the hotel. In the commercial area on the second floor is the Convention Center, which was built for music concerts and special events. The Convention Center is a hall about 300 by 130 feet. At one side there is a special platform about 15 feet high which provides a good viewing area from almost every angle of the room. The audio is incredibly good especially prepared for music. There were prepared tables with ten seats, little tables just enough for some food and drink from the hotel service. The first five table rows cost 400 Quetzales (local currency), about 50 Dollars. The other tables from row six to the last one were priced 200 Quetzales. The far third of the hall had seating only. 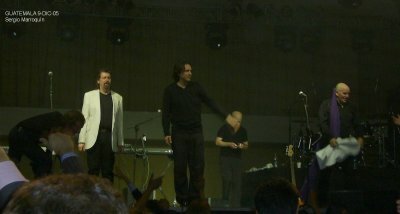 The concert hall was of course sold out, about 3000 people. There is a bilateral area as a second floor mezzanine type with special guests and sponsors. The concert was scheduled to start at 8 pm and normally there is about an hour of music from a local band. But this time there was only music videos and restaurant service. The musical instruments were in place and about 9.30 the music began. The platform was dark when we heard the first notes of Evil Woman and the scenario get brilliantly illuminated with wonderful coloured lights. All the people started to sing the songs, jump, smile and expressing the joy of music in their faces. There was a non stop music show. Kelly Groucutt and Parthenon Huxley were in front. In our left side back were Louis Clark and Eric Troyer. Mik Kaminski was always walking around. At the back on drums wasGordon Towsend. In the middle of the concert Kelly presented Louis as the 'senior member'. Lou comes to the front with his white jacket and did the formal presentations of the group. The public reaction to the ELO classic hits was great and the members of The Orchestra enjoyed the crowd reaction. Kelly said they were happy to be in Guatemala, to notice that the people know them, can sing the songs and they have a new country in their visiting list. Because there were tables with food and drinks Kelly said that looks like a Christmas Celebration. The reaction to the new songs was not so loud, with the exception of Twist and Shout because this is a well known song. 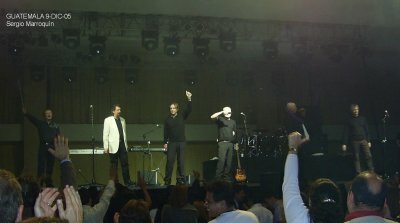 After more than two hours of music, mostly ELO hits they ended with Last Train To London the greatest hit in Guatemala. They said goodbye and went away but the crowd was in standing ovation about three minutes and widely screaming “Otra, Otra” meaning 'Another Song, Another Song'. And of course they came back with Don’t Bring Me Down with Kelly making the crowd sing 'I'll tell you once more before I get off the floor Don't Bring Me Down'. It was very exciting and we sang it so many times until we got tired. That was definitively goodbye and the end of the show. I went with my wife and two daughters (24 and 21) and for us it was a wonderful experience to see The Orchestra live!! !